1. My son, Emi, is without a passport; he is passport-less, a person who cannot cross international frontiers. This is putting a serious dampener on our Easter holiday plans, because without the necessary paperwork we cannot go home to Spain to spend the time with my husband's family. It's my fault (of course) as I failed to notice in time that his travel documents were coming to the end of their life, and now it's also the Irish Embassy's fault because they are taking an inordinate amount of time to get him kitted out with a new passport. They're an impossible bunch to deal with down at the Embassy. They randomly switch off the telephones when they can't be bothered to answer them, and forget about trying to send them an email: that just goes on a one-way trip into cyber-nowhere-land! 2. Meanwhile down at the National Gallery in Trafalgar Square they're busy researching climate change. Researching climate change? In the National Gallery? Yes, really. They've discovered that the great artists have faithfully recorded all the colour pigments of smog over the course of the industrial revolution, and after major volcanic eruptions. JMW Turner is apparently top-dog in the scientific accuracy stakes. His famous sunset paintings faithfully record all the colour spectra of the various dioxides, sulphides and other pollutants that affect the colour of the sunset. They're saying that his information on the subject is as reliable as that stored in the ice cores of Antarctica. 3. 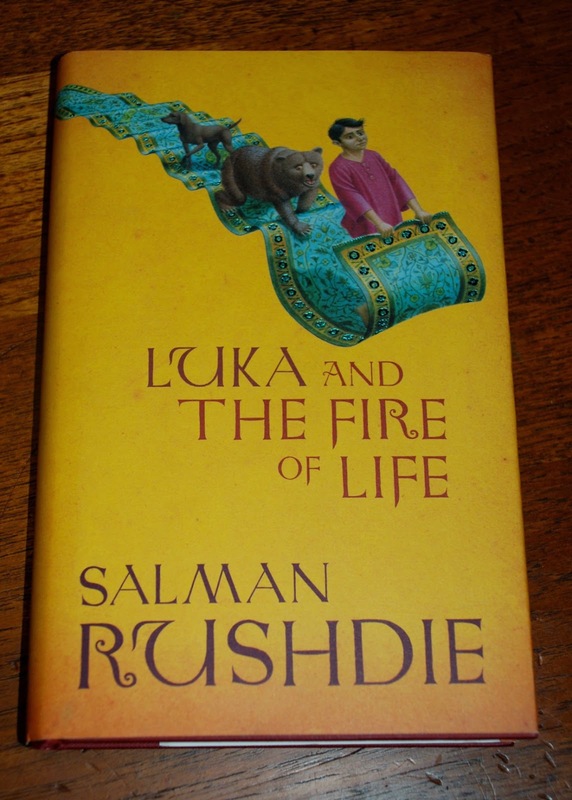 Emi and I have been reading Luka and the Fire of Life by Salman Rushdie at bedtime this week, and I want to tell you that it totally rocks! It's a truly great read for children and for adults who still believe, just a little bit, in magic. I'm a big Rushdie fan. When he's on form no one else can touch him, and I think his brand of Magical Realism is at its best when it's written for children. Luka and the Fire of Life has been written as a sequel to the equally fabulous Haroun and the Sea of Stories, so it's probably best to start with that one first if you're interested. 4. I got a lovely Mother's Day card from Emi. He'd made it for me at school and signed it off "From your dearest boy", which sounds nice, in a slightly old-fashioned, Edwardian, sort of way. In England we celebrate Mother's Day on Sunday. 5. Also on Sunday - well, ok, at midnight Saturday night to be totally accurate - we put our clocks forward to British Summer Time, and I think it's not a moment too soon. We had the equinox over a week ago, and I've been noticing the bright mornings and waking up earlier. I wish they'd just leave the clock permanently fixed to British Summer Time. It would allow us to live so much more of our lives in daylight. One of the things that I find really difficult about winter in this country is the darkness in the depths of December and into January. Maybe if the Scots vote for their independence the rest of the country won't feel inclined to move the clock around for the benefit of the Hebridean sheep farmers, although I do hope the Scots decide to stay part of the UK. Speaking as someone of Scottish descent I'd be sad to see them go their separate way. Thanks for the info on the National Gallery fascinating and I'm with you with the clocks changing. Have a great weekend. Hi Bonny, sorry your Spain trip is delayed. I know all about out-of-date passports...argghh. Really enjoyed reading about the National Gallery, Turner and climate change. Wow! I'm making a note of the Rushdie books. I think my grandson would really enjoy them. Leave the clocks alone, I say! ;) Happy Friday! We will change to summer time this weekend. I also don't understand why they do it everywhere ! With passports and embassies it's really crazy sometimes. I had a passport for 32 years with the name of my husband. When I wanted to renew it at the German embassy, they realized that it was the wrong name, because I should have kept my maiden name according to the law here and the new law in Germany. Now I have my passport with my maiden name, and I had to wait 2 months to get it, because they had to send it from Brussels to Berlin ! Very interesting post. - I hope you get the Passport problem worked out. I think there is always some agency somewhere that pretty much takes their sweet time in getting things done. It's frustrating to say the least. I find it fascinating to learn what other countries do for holidays and such. Mother's Day here in the US isn't until May. The time change here took place on March 9, I love the longer daylight hours myself. we changed our clocks a couple of weeks back. i love the longer days too! 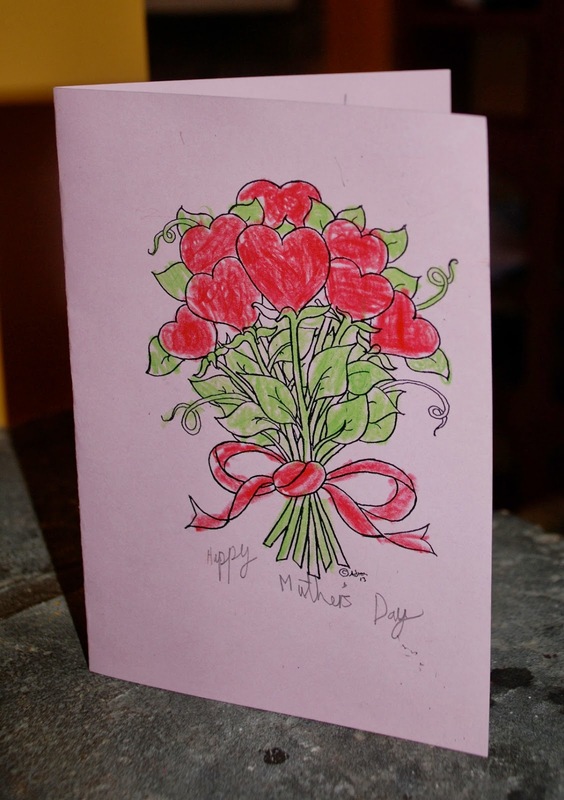 what a sweet mother's day card...hope you get the passport soon, looks like a beautiful place to be!